2003 Arnulfo D. Trejo Librarian of the Year! The Trejo Librarian of the Year Award Committee is pleased and honored to announce the Trejo Librarian of the Year for 2003. Sandra Rios Balderrama, former Director of the Office for Diversity of the American Library Association and former President of REFORMA (1997-1998) has been selected as the 2003 Arnulfo D. Trejo Librarian of the Year. Passionately supported and nominated by the former Chair of the Colorado Chapter of REFORMA, Beckie Brazell of Denver Public Library, Ms. Balderrama's great gift for library community building and deep commitment to diversity is appreciatively acknowledged. 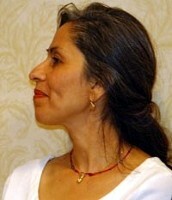 Throughout her career, while at Berkeley Public Library, Oakland Public Library, National REFORMA, and at the American Library Association, Ms. Balderrama has so positively impacted her colleagues that they have been "touched and changed for the better because of Sandra's commitment to librarianship and diversity issues". For three years her personal dedication and leadership contributed to the growth and development of REFORMA when she served as the national President from 1997-1998, the Vice-President/President-elect 1996-1997, and Immediate Past President in 1998-1999. Her legacy to REFORMA as a member and as an officer, as stated by Ms. Brazell, "contributed significantly to the founding of three committees/projects now integral to REFORMA - the Children's Committee, the Pura Belpre award and the Information Technology Committee." Ms. Balderrama's professional career in librarianship has for many years been closely associated with issues of diversity and the recruitment and retention of librarians of color. As a junior librarian at Berkeley Public Library she was instrumental in the creation of the Multiethnic Committee that planned, among many activities, a Staff Awareness Day, "Working Together Across Racial Lines", that continued to influence the library staff until at least the early 1990s. From Berkeley she moved to Oakland where from 1995 to 1997 she was the coordinator of Recruitment, Staff Development and Retention for the Oakland Public Library. Her contributions to Oakland, too extensive to list completely, include coordination of a Diversity Training Pilot Project, establishment of a system and procedures for recruitment, development of a Library mentoring Project and the FOPL Scholarship Program. As the first librarian to hold the position of Director, American Library Association Office for Diversity from 1998 to 2002, Ms. Balderrama was aggressively involved in determining the path and successful future of the ALA Spectrum Scholars Program. Under her influential guidance the Spectrum Leadership Institutes have successfully provided rewarding mentoring, management training, and created an atmosphere of acceptance where librarians of color could learn to focus on librarianship as a professional career. Upon her leaving the position of Director of the Diversity Office, the ALA Council on June 19th, 2002 passed a Resolution honoring her outstanding work, acknowledging her numerous contributions, and commending her exemplary service to librarianship. This outstanding record of achievement and leadership merits the honor of recipient of REFORMA's 2003 Arnulfo D. Trejo Librarian of the Year Award.